Evolution and Diversity: Octopuses: Smartest Invertebrate? For many years, scientists believed that vertebrates were the only creatures capable of intelligence and thought. Now of course we know that many invertebrates, including squids and octopuses, have large brains and a high level of intelligence. Even slime molds, which have no nervous sytem, are seemingly capable of thought. How are octopuses, who belong in the same mollusc category as snails and clams, capable of such intelligence? One reason is that a octupus brain and a human brain are strikingly similar. "Although an octopus brain differs from a typical vertebrate's brain—it wraps around the esophagus instead of resting in a cranium—it also shares key features such as folded lobes, a hallmark of complexity, and distinct visual and tactile memory centers. It even generates similar electrical patterns." In addition to having a well-developed brain, octopuses have specialized features and complicated eyes. "Octopuses, which rely on monocular vision, favor one eye over the other. Such lateralization, corresponding to our right- and left-handedness, suggests specialization in the brain's hemispheres, which is believed to improve its efficiency and which was first considered an exclusively human, then an exclusively vertebrate, attribute." Scientists are still studying octopuses and are constantly finding out new and interesting things about these cephalopods. For instance, octopuses are known to exhibit clever and curious behaviour. 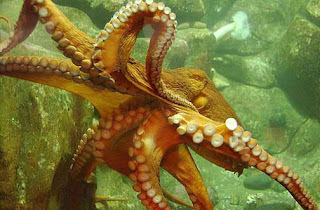 Many octopuses will 'play' with a diver and tug at their masks and air regulators. There are even accounts of octupuses blocking drains, causing floods, and sneaking out of their tanks to eat fishies in neighbouring tanks. Interesting fact: An octopus has no bones and can fit through a hole the size of a quarter! They are also able to solve simple mazes and have short term memory. Unfortunately, many octopuses live extremely short lives, some even less then a year! "Octopuses challenge the deep-seated notion that intelligence advanced from fish and amphibians to reptiles, birds, mammals, early primates, and finally humans...Genetic studies show that mollusk ancestors split from the vertebrates around 1.2 billion years ago, making humans at least as closely related to shrimps, starfish, and earthworms as to octopuses. And so questions loom: How could asocial invertebrates with short life spans develop signs of intelligence? And why?" PS: There are tonnes of internet debates over whether the plural is Octupi or Octopuses. Many dictionaries say the 'proper english' plural is octopuses. Very interesting blog post indeed! Poor shark!